Despite effective treatments, many hospitals lack systems to facilitate treatment for substance use disorders after hospital discharge. We provided infrastructure to increase substance dependence treatment after hospital discharge and evaluated predictors of addiction treatment initiation. From March 31, 2004, through April 30, 2005, we performed a cohort study of non‐ICU patients at a 464‐bed urban hospital. Patients ≥ 18 years were evaluated for substance use and dependence through bedside interviews by trained counselors; patients with dependence disorders were referred to addiction treatment facilities. To reduce delays and increase patient options, we offered a novel treatment—”brief treatment.” To evaluate predictors of treatment initiation within 60 days after discharge, we joined interview data to our state's billing database. 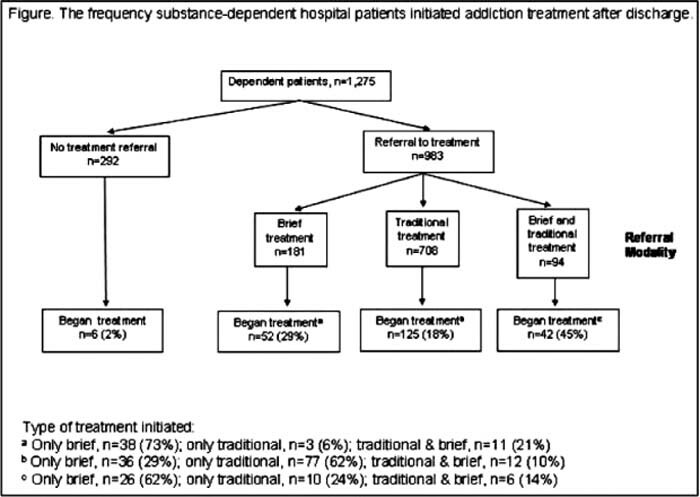 Of 983 patients with dependence disorders who accepted referral, 219 (22%) initiated addiction treatment. 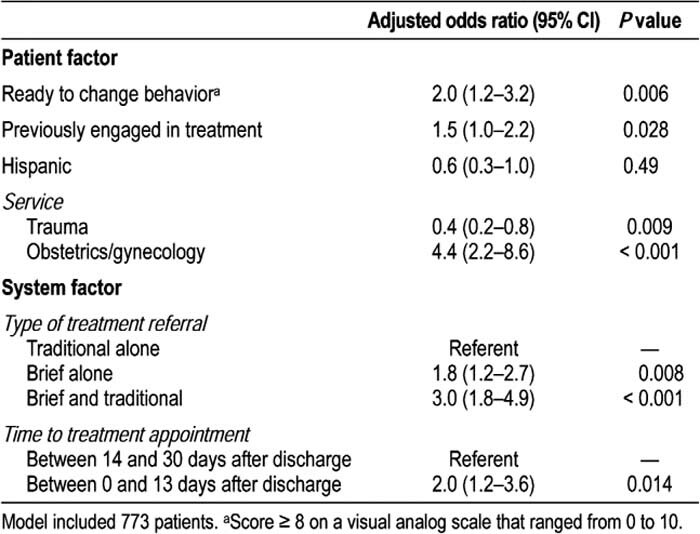 By multivariable analysis, patients were more likely to begin treatment if their scheduled appointment was less than 14 days postdischarge (adjusted OR, 2.0; 95% Cl, 1.2–3.6) or if they received a referral to brief treatment (aOR, 1.8; 95% Cl, 1.2–2.7) or brief plus traditional treatment (aOR. 3.0; 95% Cl. 1.8–4.9). Initiation of treatment increased from the first to the final quarters of the study period (15% vs. 41 %, P < 0.001); concurrently, the number of brief‐treatment referrals increased, and time to appointment decreased. Patient‐level predictors of treatment included previous addiction treatment, high motivation to change use, and obstetrics‐gynecology admission. Hispanic and trauma patients were less likely to initiate treatment. Changes in health service delivery, such as reducing the time to scheduled treatment appointment and expanding options to include individualized, brief treatment, dramatically increased initiation of substance dependence treatment after hospital discharge. S. Borkowsky, none; W. Trick, none; J. Asbury, none; C. Ezike, none; C. Ojiello, none; S. Schabowski, none; J. Smith, none. Borkowsky S, Trick W, Asbury J, Ezike C, Ojielo C, Schabowski S, Smith J. Treatment of Substance Dependence after Hospital Discharge. Abstract published at Hospital Medicine 2009, May 14-17, Chicago, Ill. Abstract 13. Journal of Hospital Medicine. 2009; 4 (suppl 1). https://www.shmabstracts.com/abstract/treatment-of-substance-dependence-after-hospital-discharge/. Accessed April 21, 2019.